DNA can be put into mammalian cells in a process called transfection. If you wanted to make a mouse cell fluoresce green, you could transfect it with DNA carrying the EGFP open reading frame, a promoter directing transcription of EGFP and a signal sequence for polyadenylation of the mRNA. The promoter tells the cell that the EGFP sequence should be transcribed by RNA polymerase. The polyadenylation sequence assists in the export and stability of the mRNA so that it gets translated by the ribosome. The coding sequence tells the ribosome which amino acids should be joined together. Mammalian cells can be transiently or stably transfected. For transient transfection, DNA is put into a cell and the transgene is expressed, but eventually the DNA is degraded and transgene expression is lost (transgene is used to describe any gene that is introduced into a cell). For stable transfection, the DNA is introduced in such a way that it is maintained indefinitely. Today you will be transiently transfecting your cultures of mouse embryonic stem cells. There are several approaches that researchers have used to introduce DNA into a cell's nucleus. At one extreme there is ballistics. In essence, a small gun is used to shoot the DNA into the cell. This is both technically difficult and inefficient, and so we won't be using this approach! More common approaches are electroporation and lipofection. During electroporation, mammalian cells are mixed with DNA and subjected to a brief pulse of electrical current within a capacitor. The current causes the membranes (which are charged in a polar fashion) to momentarily flip around, making small holes in the cell membrane that the DNA can pass through. The most popular chemical approach for getting DNA into cells is called lipofection. With this technique, a DNA sample is coated with a special kind of lipid that is able to fuse with mammalian cell membranes. When the coated DNA is mixed with the cells, they engulf it through endocytosis. The DNA stays in the cytoplasm of the cell until the next cell division, at which time the cell’s nuclear membrane dissolves and the DNA has a chance to enter the nucleus. Today you will lipofect several DNA samples into your mouse embryonic stem cells. As a positive control, you will transfect one sample with a plasmid encoding full-length EGFP. This plasmid will cause any transfected cells to fluoresce green. Next time we will measure fluorescence of your positive control to assess the success rate of the transfection. You will also be transfecting two experimental plasmids, one of which you have been constructing for weeks. The EGFP coding sequence on these plasmids is truncated at either the 5’ or 3’ end of the gene. Cells expressing these truncated EGFPs should not fluoresce green. The plasmids provide a wonderful tool for studying recombination since a cell will fluoresce green if it has been transfected with both plasmids and has recombined the genes to regenerate a full-length EGFP. Finally, you will be using the truncated EGFP plasmids to investigate the effect of double strand breaks on the frequency of recombination. Elaborate mechanisms for coping with DNA breaks have evolved since these forms of DNA damage are so dangerous for the cell. You should (re)familiarize yourself with these mechanisms by (re)reading the excellent review by Thomas Helleday that you can find in the References section of the Module 1 frontpage. You should also check out the animations of repair mechanisms that are linked there. These animations were made by Justin Lo, a class of '08 Course 20 student and a former UROP student in Professor Engelward's laboratory. One kind of DNA damage with particularly catastrophic consequences for the cell is double stranded breaks. The broken ends of the DNA must be correctly repaired (literally here re-paired) without loss of any encoded information. The model for such repair is called to the Szostak model, named after the person who first described it. According to this model, illustrated below, a gap in one chromosome is repaired through an interaction with its homologous chromosome. The repair first requires “homology searching” and invasion of the gapped DNA (blue) into the undamaged copy (red). The undamaged DNA serves as a template for missing sequences, which are copied and then resolved as indicated by the open triangles on the figure below. 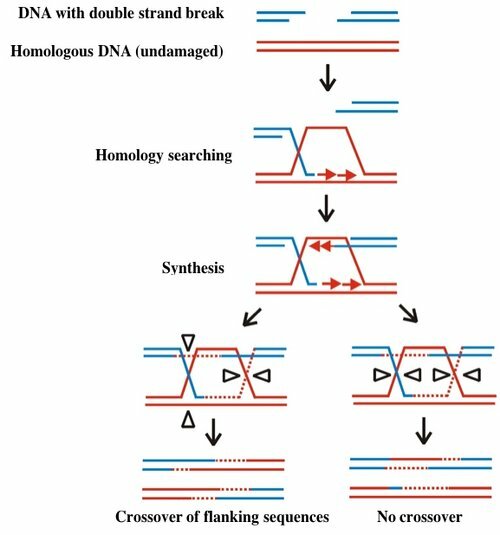 Resolution can lead to exchange of sequences flanking the original double strand break, resulting in recombination of genetic information. Alternatively the integrity of the original genetic material is preserved when the repaired strands resolve without crossover. Different, and far simpler means of repair are possible if the broken ends of the DNA can be held together, either through base pairing of the overhangs or through the chromatin structure surrounding the damage. Your investigation today will assess recombination rates for different DNA lesions and conditions for homology searching. In anticipation of your lipofection experiment, one of the teaching faculty plated 1x105 cells in 16 wells of a pregelatinized 24-well dish 24 hours ago. A special media formulation without antibiotics was used. A schematic for your experiment is shown below. 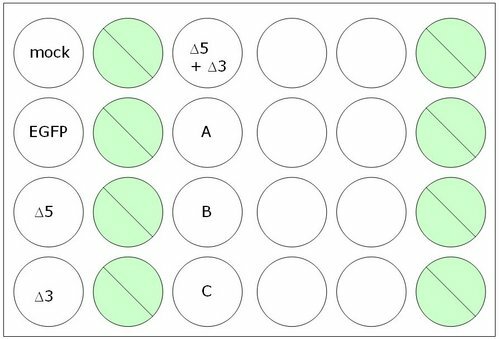 We will discuss in class different things we might test, and we will use wells labeled 'A' 'B' and 'c' to test a parameter that might affect the frequency of inter-plasmid homologous recombination. All manipulations are to be done with sterile technique in the TC facility. Timing is important for this experiment, so calculate all dilutions and be sure of all manipulations before you begin. 1. Dilute enough carrier for 16.5 lipofections. Let the dilution sit in the hood undisturbed for at least 5 minutes but not more than 30. 2. For the lipofections to be done just once, you’ll need 50 ul of DNA in OptiMEM. We will distribute to you a table indicating the appropriate volumes to use in your experiment. 3. For the lipofections to be done in triplicate, you’ll need a total of 150 ul of DNA diluted in OptiMEM. By making one lipofection cocktail that is later divided between replicates, you can be confident that each replicate was treated identically. The basic protocol is to do a lipofection with 0.1 ug of ∆5 and 0.1 ug of ∆3, though you will also be testing half as much, twice as much and 10X as much ∆3. 4. You should now have eight eppendorf tubes, four with 50 ul of OptiMEM +/- DNA and three with mixtures of Δ5 and Δ3 DNA in a volume of 150 ul. Add an equal volume of diluted lipofectamine to each eppendorf (i.e., 50 ul if the tube has 50 ul). Pipet up and down to mix. 5. Incubate the DNA and lipofectamine cocktails at room temperature for 20 minutes. To allow the DNA/carrier complexes to form, it is important that you do not disturb the tubes during this incubation. During this time, aspirate the media from the cells in your 24-well dish, wash the wells with 0.5 ml PBS, then put 0.5 ml of fresh media on the cells. The PBS and media can be aliquoted with a 5 ml pipet. 6. After the 20 minute incubation is over, use your P200 to add 95 ul of the appropriate DNA:lipofectamine complexes to each well. Since the carrier is quite toxic to the cells it’s a good idea to gently rock the plate back and forth after each addition. 7. Return the plate to the 37°C incubator. You will have the opportunity to turn the data you collect in these last few days of Module 1 into a "Memo". The memo should be no more than 2 pages and should follow the template that is here, and should include a summary, a discussion and a recommended action, as described here. You can also include any supporting documentation that you feel is helpful. You do not have to turn this draft of your assignment in to the faculty but by beginning this work today, you'll have time to get feed back and have questions answered. You will have to turn in a final "memo" after you collect your flow cytometry data next time. This page was last edited on 4 October 2009, at 17:52.